Nakheel today began leasing at Nad Al Sheba Mall, a new, 1.2 million square foot shopping, dining and entertainment destination at Dubai’s increasingly-popular residential area of Nad Al Sheba. 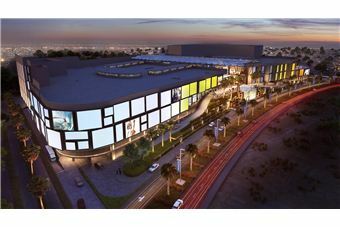 Nad Al Sheba Mall, part of Nakheel Malls’ AED16 billion expansion, will have 200 shops, restaurants and entertainment outlets including a supermarket, department stores, multi-screen cinema, medical clinic and fitness centre spread across 500,000 sq ft of shop space. Construction is due to begin in Q4 2017, with completion mid-2020. Located just off Sheikh Mohammed Bin Zayed Road, the mall be the vibrant centrepiece of Nad Al Sheba, a well-populated community with around 11,500 high end villas, mostly occupied by UAE nationals. The area includes Nakheel’s upcoming Nad Al Sheba community, set in lush grounds spanning 2.5 million sq ft, and featuring 1,500 four and five bedroom homes plus a club house, swimming pool and sports courts. The community also features a 5 km cycling track – the first in Nakheel’s recently-announced AED150 million scheme to bring a 105 km network of bike routes to Dubai. Nakheel is set to become the region’s biggest retail developer, with 17 million sq ft of leasable space across 18 projects, including large-scale malls, souks and neighbourhood retail Pavilions. Four million sq ft is already operational through Ibn Battuta Mall, Dragon Mart, Golden Mile Galleria and five neighbourhood Pavilions.